The Kusha Kusha scarf was progressing so quickly (finished, needs blocking) that I started another project as well. 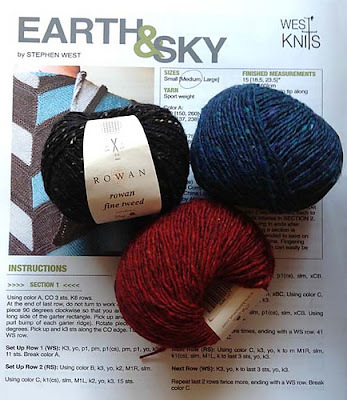 I shopped my stash for some yarn that I bought almost two years ago to make Stephen West's Earth & Sky shawl. I envisioned it as a Colorado Avalanche shawl when I chose the colors. The yarn is Rowan Fine Tweed. I'm hoping that there will be enough drape, but I'm okay with the project is there isn't. I like this yarn and it's deep rich colors. 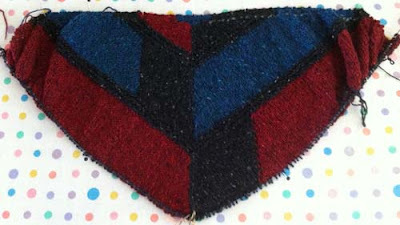 It's a well-written pattern and the color work appeals to my ever-lovin'-intarsia heart! The project has been going quickly, especially since I've been knitting while rewatching past episodes of Breaking Bad (almost caught up - soon to watch the current one). After only a few days of knitting I find myself working the border with around 400 stitches on the needles. I'll definitely have it finished by the time hockey season rolls around. GO AVs! !